Attorney Daniel E. Casagrande was reappointed to the Board of Directors of the Greater Danbury Chamber of Commerce at the board’s annual meeting Nov. 2. 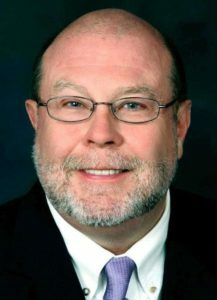 “The Chamber is a dynamic organization working in myriad ways to sustain and improve the business climate in Greater Danbury, and I’m privileged to serve on the board with very distinguished members of the region’s business community,” said Attorney Casagrande, a Partner in Cramer & Anderson’s Danbury office who holds the distinction of being Connecticut’s “Giant Slayer” for his notable work as a municipal attorney. 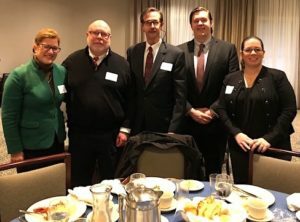 Attorney Casagrande was joined at the Chamber’s annual breakfast meeting by Cramer & Anderson Partners Jennifer Collins and Barry Moller, and Associates Lisa Rivas and Graham Moller. In all, nearly 300 guests attended the meeting. As part of its mission, Attorney Casagrande explained, the Chamber is introducing younger people into the business community, and connecting them with networking opportunities, in part through the Chamber’s Young Professionals Council. From left, Attorneys Jennifer Collins, Dan Casagrande, Barry Moller, Graham Moller, and Lisa Rivas at the Chamber meeting. The Chamber, with an active roster of 671 members, and annual events that draw nearly 6,000 attendees, has been undergoing significant recent change, including the addition of of the organization serving a 10-town region with initiatives that sustain economic vitality, promote economic development and enhance the appeal for businesses to locate and grow in Greater Danbury. For its members, the Chamber acts as the voice of the business community, and provides business promotion and support and networking. Prospective members can read more, and join, via the Chamber’s website, where you can also find the list of upcoming Chamber events. Attorney Casagrande has achieved successful outcomes in a number of complex, high-profile cases, including the 1998 Union Carbide appeal of the municipal tax assessment valuation of its Danbury, Conn., headquarters, equating to a $307 million market value. As outside Assistant Corporation Counsel, Attorney Casagrande represented the City of Danbury. The trial court upheld the City’s valuation after a 24-day trial, Union Carbide appealed, and Attorney Casagrande ultimately prevailed before the Connecticut Supreme Court, safeguarding $10 million in tax revenue for the City. The Town of Waterford retained Attorney Casagrande when Dominion Nuclear Connecticut, Inc., owner of the Millstone Nuclear Power Station, appealed the town assessor’s $1.2 billion valuation of Millstone for tax purposes. Attorney Casagrande went up against a law firm with more than 400 attorneys in offices from Boston to Washington, D.C., and after a four-year battle and a 24-day bench trial the court preserved 93 percent of the town’s valuation. It’s believed to be the largest assessment appeal litigated in Connecticut. Based in western Connecticut, Cramer & Anderson has a hometown sensibility, a strong regional presence, and a worldly outlook in Practice Areas extending from Estate Planning, Elder Law, Estate Administration and Personal Injury to Real Estate, and much more. In addition to a flagship office on the Green in New Milford, the firm has offices in Danbury Litchfield, Kent, Washington Depot, and a new office in Ridgefield, serving Fairfield County. For more information, see the website at crameranderson.com or call the New Milford office at (860) 355-2631.